Business has been tough for the dressmaker Kathlin Argiro during the recession, as it has for virtually every small business on Seventh Avenue. Seeing other designers close their doors, she was determined to save her studio by whatever means she could dream up. “Out of necessity comes creativity,” Ms. Argiro said last week, speaking over the din of a half-dozen teenagers who were sprawled on her floor, cutting pages out of magazines. For four days, she set aside her design work for a venture that taps into the career aspirations of the “Project Runway” generation, basically a stylish boot camp, called Fashionista Prep. For $495, students learn the ropes of design, public relations and styling from Ms. Argiro and her colleagues. Feeding into the interest in fashion careers, LIM College hosted a seminar for teenagers this month, Teen Vogue has its Fashionista University and other summer fashion camps have popped up around the country. Ms. Argiro said that she was somewhat frustrated to hear from potential investors who were more interested in her instructional business than her dress line. Amy Teaches Styling to Teens! All that aside, I am 31 and am twice the age of these lovely gals which means I do have the experience to teach them all about the styling world. 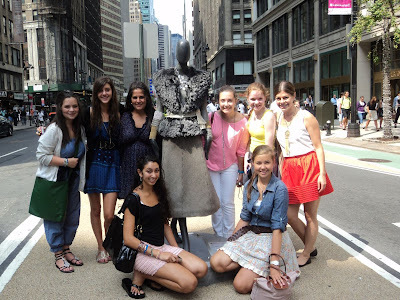 For 4 days last week, I took 7 lovely young ladies under my wing and taught them the in’s and out’s of fashion styling. From personal styling to photo shoot styling, each and every one of them showed off their creative skills. I was overwhelmingly impressed with each of their innate abilities to style fabulously! I can tell you this, at 15 years old my style was non-existent. I believed I knew what I was doing, but until around 23, I really had no idea. I look back at pictures with my Doc Marten boots and Abercrombie sweaters and just ask myself, “Why!?!”. So any good styling class is going to have to be hands on. I remember sitting in lecture halls in college thinking, “Who the hell is really paying attention to this overhead slide and monotone teacher?”. Well, certainly not me. I believe in bringing students into the mix and actually getting their hands dirty! One of the challenges for the class was to create a “fashion closet” for the girls to style from. What better way then to have them each bring in their own favorite pieces and borrow a few from their sister or mom. Of course I brought in a ton too. With jewelry, shoes, belts, bags and clothing, we were ready to go! Before we could dive into the styling, I wanted each of the girls to create an inspiration board for their “photoshoot”. Arts and crafts never gets old! Everyone brought in their favorite fashion magazines and began to chop. I directed each of them to not only cut out fabulous outfits that would match their concept, but also to choose a model with the right look for their shoot. They were to create full concepts from clothing to models to set design. The best part about this little project is that style writer Eric Wilson from the NY Times was there to watch the whole thing so he could write a story. Check him out in the mirror! And now for the finale! I encouraged the girls to be creative and think outside of the box when creating their outfits. We were not specifically pulling clothing with a concept in mind when we created our “fashion closet”, so we had to work with what we had. Luckily, in addition to bringing in our personal wardrobes, the class was held at Kathlin Argiro’s design studio so we had tons of couture pieces to choose from! Jaclyn and Catherine decided to go with an “Alice in Wonderland” theme. They created a gown utilizing different loose pieces in the showroom. As opposed to many shoots where there would be a bevy of gowns to choose from, they had to be super crafty and create their look from what we had. In styling, a lot of times things are technically one thing, but are used as another. Just like the scarf they used to create a skirt, not a usual place for such a thing, but it works! Overall, the class was a smashing success! Each of the girls individually thanked me for taking them into the world of styling and showing them what it is all about. It is crazy, it is fun, it is often times overwhelming. But, at the end of the day, you are being creative, doing what you love and playing dress up for a living!!! !